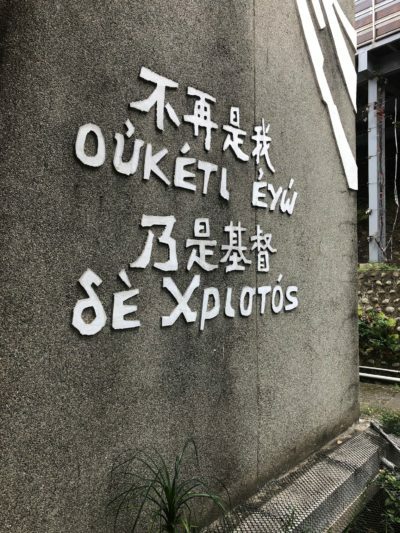 “No Longer I But Christ” | "Northern Crossings"
I believe the name of this place was Hsinchu and here we visited the China Lutheran Seminary. Their motto above is “No longer I but Christ”. I take that to be from Galatians 2:20 – Here is a section of Luther’s Commentary of that passage. “Thus I live,” the Apostle starts out. But presently he corrects himself, saying, “Yet not I, but Christ liveth in me.” He is the form of my perfection. He embellishes my faith. Paul has a peculiar style, a celestial way of speaking. “I live,” he says, “I live not; I am dead, I am not dead; I am a sinner, I am not a sinner; I have the Law, I have no Law.” When we look at ourselves we find plenty of sin. But when we look at Christ, we have no sin. Whenever we separate the person of Christ from our own person, we live under the Law and not in Christ; we are condemned by the Law, dead before God. Whenever remission of sins is freely proclaimed, people misinterpret it according to Romans 3:8, “Let us do evil, that good may come.” As soon as people hear that we are not justified by the Law, they reason maliciously: “Why, then let us reject the Law. If grace abounds, where sin abounds, let us abound in sin, that grace may all the more abound.” People who reason thus are reckless. They make sport of the Scriptures and slander the sayings of the Holy Ghost.